Knitting a baby sweater is the perfect way to learn all the sweater techniques that would be necessary to knit an adult sweater, in a fraction of the time, and with a hopelessly adorable result! Our Gramps cardigan is a perfect example, while it is a relatively simple design, its simplicity requires a good number of intermediate knitting techniques such as: increasing and decreasing stitches, pattern reading, knitting in the round, picking up stitches (both along an edge, and in the middle of the fabric), short-row shaping, buttonholes, and some seaming / finishing. This seems like quite a long list of techniques and may seem quite daunting; but these techniques are the same ones that are required in a lot of sweater knitting, and if you take them step-by-step, each one is easy to accomplish. 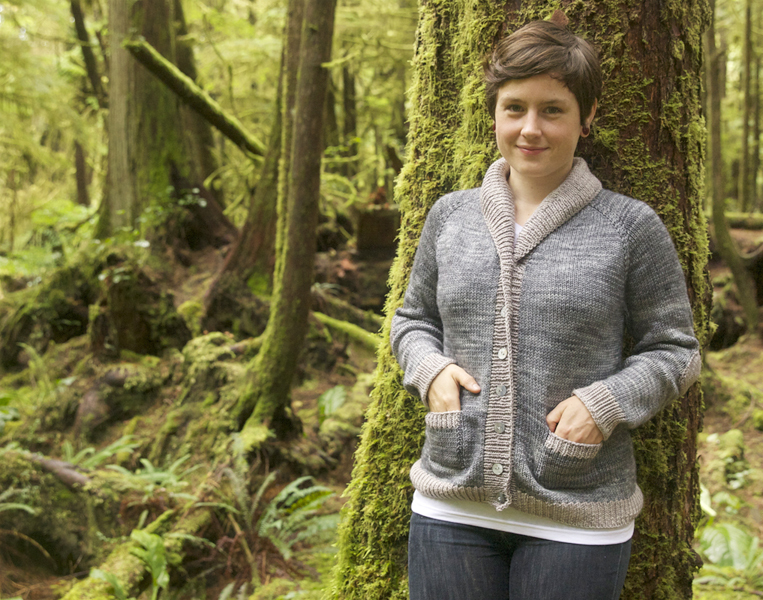 If it still seems like too much, try our Flax or Harvest sweaters, 2 of our free patterns from our learn to knit series, The Simple Collection. 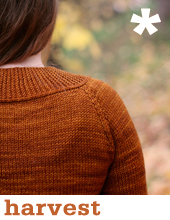 There is no better way to learn than doing right?- so purchase a copy of the pattern, grab your needles and yarn, and follow along as we explain everything in a clear, step-by-step manner. If you have questions, we hope you will post your comments, or email us and we will make every attempt to incorporate the answers to your questions into this tutorial. The Gramps Cardigan tutorial is created as a series of 6 illustrated posts, clearly explaining each of the techniques required to knit the Gramps Cardigan. Ravelry.com is a fabulous community and resource for knitters and crocheters all over the world. On Ravelry you can check out the Gramps sweaters that other people have knit, read their suggestions, and see what yarn and colour combinations they chose. It is a great place to start before any project! Is this sweater knit in the round? It’s knit back and forth, but the sleeves are knit in the round. for M1 on the gramps sweater, I looked up how to do it on your site (which is awesome by the way) and you recommend doing a M1R before a marker and M1L after a marker. What about the front edges where you also add a stitch? Which M1 would you recommend? I just cast on, sooo excited to make this one! I’m enjoying knitting the gramps cardigan and also learning a lot but not sure when it says cast on row for back of neck is it including raglan edges or just back off neck and does this need to be odd stitches. Hi Jeanette – it includes all the sts cast on at the beginning of the pattern, and it should be an odd number. Thank you! I’ve just finished my Gramps cardigan for my grandson and am really pleased with it. Learnt so much – had never knitted from top down, never done short rows and had only ever knitted the odd beanie in the round so the sleeves were a new skill as well. The tutorial was great, couldn’t have done without it. I had a few glitches so will make another one to try and sort them out. I ended up with a few holes under the arms- easily sewn up and you can’t tell but suspect I did something wrong when separating them. Had to redo the button band as I went wrong picking up the wrap stitches at the end. Second time through was better but the wrap is obvious – and although on the back on one side the other side is on the front. A comment on the blog suggests that if a pearl stitch you need to pick them up from the other side? Not sure how this works – perhaps could include in the tutorial. Regardless, couldn’t bear to do band a third time and it’s not to obvious. Finally I think next time for the smaller sizes I would do a two stitch rather than a three stitch button hole – think they are a bit too big. Love it despite not absolutely perfect. Thanks! Hi. I am tryin to pick up the stitches to add the pocket on this sweater. I a, not quite sure how to do this. Is there a tutorial somewhere that I could watch? Anxious to continue with this sweater so I’ll post here also. I am making size 6-8. I finished the yoke increases at 203 stitches just like I said it should be. Then I come to Work rows 1-2 two more times with a bunch of parentheses with numbers between “two” and “more” Since I’m knitting size 6-8, my number is 1. I have not idea what I’m to do. 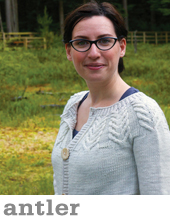 Do I knit Row 1 and 2 two more times–then my stitches would increase to 211. The pattern says I’m supposed to still have 203. All the other sizes went up except size 6-8! What do the numbers in the parentheses mean since there already a “two more times”. How can I do more increases if my final stitch count is still to be 203???? Please help! Somebody! Hi Barbara – for that instructions there is a two outside the brackets. Your size is the 5th size in brackets so you are working rows 1 and 2 a further 0 times. Thank you so much. Back to knitting! I have a question. I am knitting this sweater for a child 4-6. On yoke after working the 1-4 rows I have 179 stitches. Next I am to work rows 1-2 (0) times and have 187 rows. Is this just a typo??? Hi Robin – there is a written out two in front of the brackets, so your size is working rows 1-2 one more time. 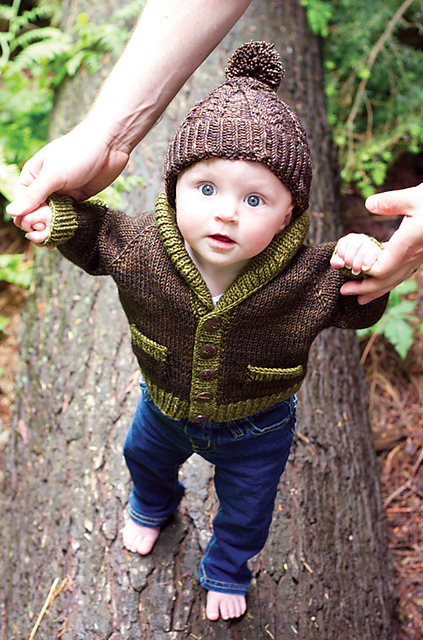 I’ve been looking for the “right” sweater to knit for my little great nephew John Christopher and this is it!! 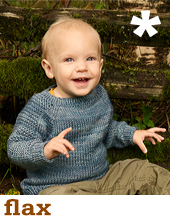 I bought the pattern, reading it over and I am excited about starting this sweater for him, for he lives in England with mommy and daddy and it gets cold there. I love the collar for this will keep his neck warm. Thank-you for your wonderful patterns and thorough explanations on each step! Much appreciated!!! Can you tell me what’s name of green color? Twig is the brown and Grove is the green. Thanks!